110 of the light pacifics were built to the design of O.V. 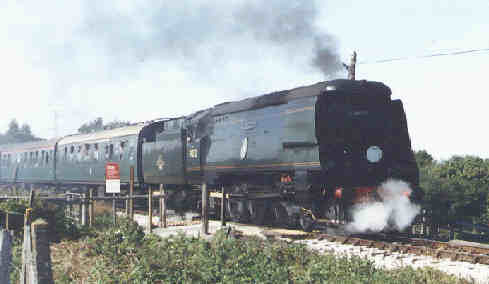 Bulleid in the immediate post war years, they formed the West Country and Battle of Britain classes, which were originally fitted with air smoothed casing and chain driven valve gear as on 34072 252 Squadron seen in the first two photos on this page on the Swanage Railway in Dorset. 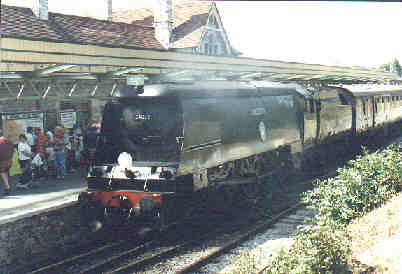 The first of these shows her at Swanage station, the second near Corfe Castle. 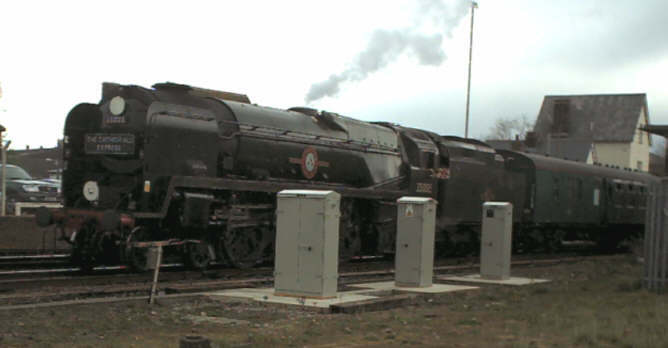 In this form they were amazingperformers, but at a price of high coal consumption and problems with the novel valve gear, which included fires in the oil bath that the chain ran in. 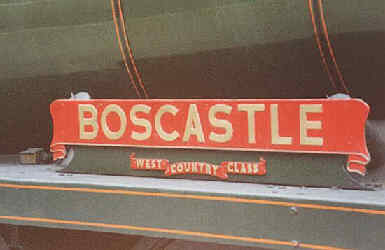 As a result many were rebuilt as exemplified by 34039 Boscastle, seen here in four views taken by John Griffiths on the Great Central Railway. 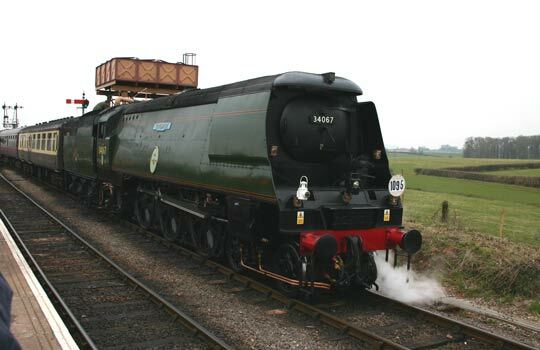 The rebuilding took the form of conventional boiler cladding, reducing the boiler pressure from 280 to 250 psi, conventional valve gear and, unfortunately, a new inside cylinder. 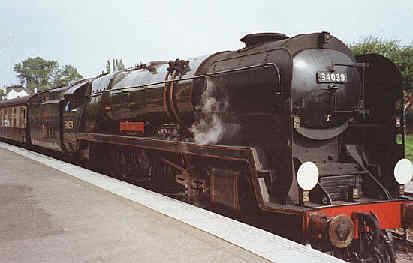 Unfortunate because they were apparently never quite so free steaming because of this change, but even so they were impressive machines, as were their larger cousins, the Merchant Navy Class (see 35005 below) all 30 of which were rebuilt. It was never the intention to rebuild all the light pacifics as the rebuilds were heavier and so couldn't operate over all the routes the originals could. 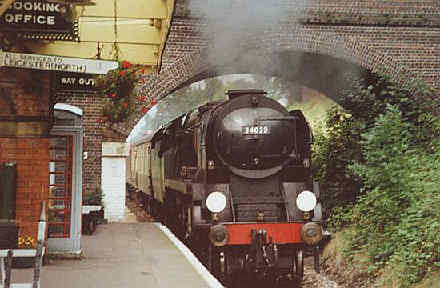 I have vivid memories of all three classes in service on the Southern around Exeter in the early 60's, the thunderous roar of their safety valves, their propensity for slipping on starting... The Atlantic Coast Express, 11 a.m. from Waterloo would arrive at Exeter Central, the Merchant Navy and the the dining car come off, a light pacific take over and be down at Exeter St David's before the D800 diesel hauled Cornish Riviera, 10:30 a.m. ex Paddington ran in !! 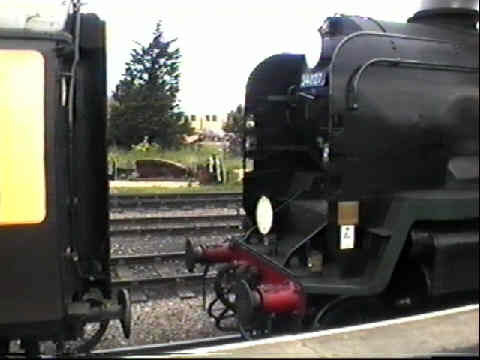 With the last stop being at Salisbury the Merchant Navies could gain enough time to be back out to Exmouth Junction shed before they were booked to pass with the ACE. What wonderful times, but the march of progress saw the Southern route downgraded and D800's supplant the Bulleids in 1965, life was never quite the same after. 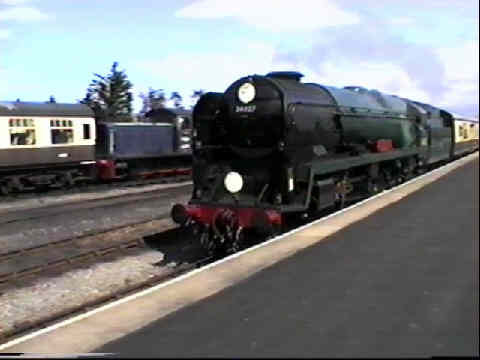 Next we have four views of 34027 Taw Valley, another rebuilt West Country which is seen at Minehead on the West Somerset Railway. Next her nameplate, many of the class had shields with the arms of the town or city above the nameplate. 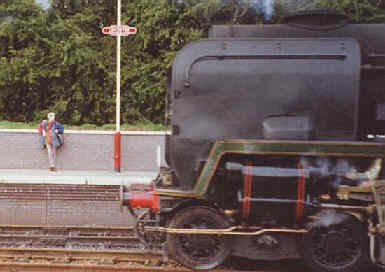 The third shows her about to buffer up to her train, prior to returning to Bishop's Lydeard, a job that calls for a lot of skill from the driver who has to look along the length of the boiler to see how close he is to the train. 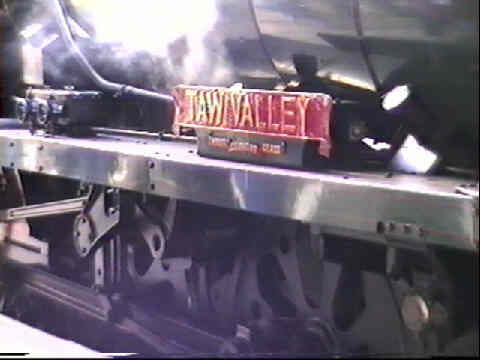 The driver of Taw Valley is being handed the toekn for the single line section. The driver has to be in possession of the token before entering a single line, so preventing trains meeting head on in the section. 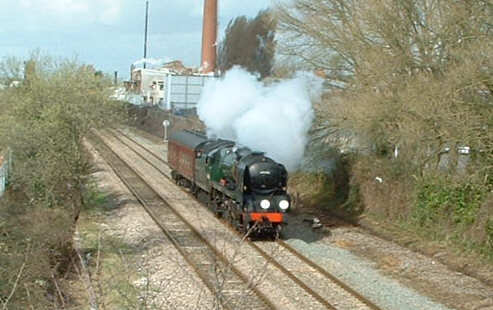 Another view of "Taw Valley", this time passing Bridgwater with her support coach en route to the West Somerset Railway's Spring Steam Gala in March 2004.